Mediums include handmade paper, collage, mixed media, watercolor, encaustic and altered art. 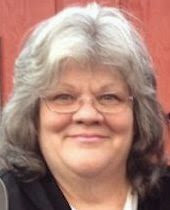 I now have a website, http://cherylstevenson.weebly.com complete with a home for my blog. If you will follow me over there, I would love it! Is it Spring yet? LOL Because I am back! Sorry, let some medical issues I'm struggling with get the best of me. However, creating and sharing my artwork is my enduring bit of joy, no matter what. I had forgotten. 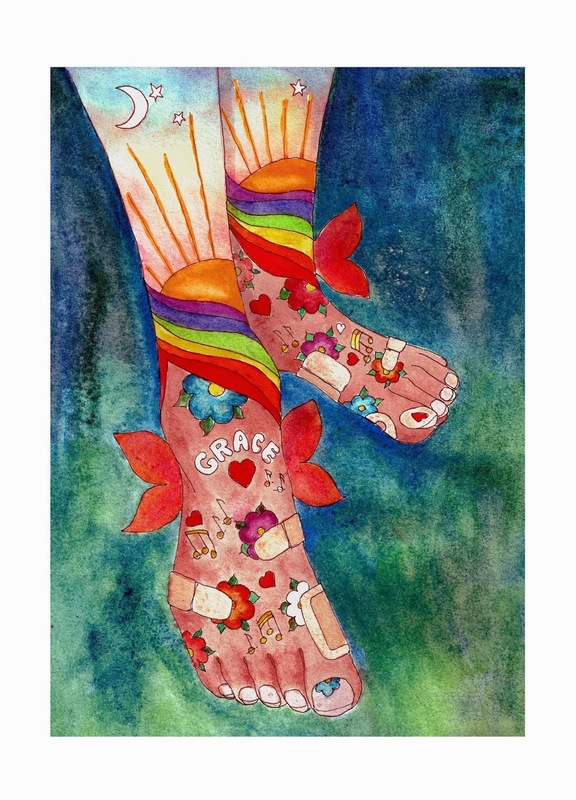 Jani Franck's new e-course, Comfort and Joy reminded me how much joy there IS in my life, even in the midst of struggles. A good example is the artwork below. It is a collaboration with my good friend and UBER SUPER talented photographer and digital artist Judy Horn. We printed her "Barnacle Lace" on some of my handmade paper (using Daniel Smith's new Digital Ground on the paper to prepare it to accept ink). Then, in my studio, I found (serendipity!!) a piece of my hand-dyed paper that seemed to echo and re-echo the color and texture of her photo on my paper. That is JOY! Thank you for stopping by. On hiatus until Spring. I've Been Published in a Fabulous New Book by Leslie Riley!!!! The quote I was given by Leslie to illustrate for her book Quotes Illustrated was “In life as in dance: Grace glides on blistered feet” Alice Abrams, and the painting is I created, and which was selected for the book is shown below. Hard to work in my studio on regular projects because of my neck and arm, but I am finding other ways to play while I await surgery. I am a huge Pinterest fan, and I collect ideas there to tryout. This "Snippets" idea came from Carole at kiwicarole.blogspot.com/ (scroll down on the right side of her blog for directions to make your own "Snippet" ! 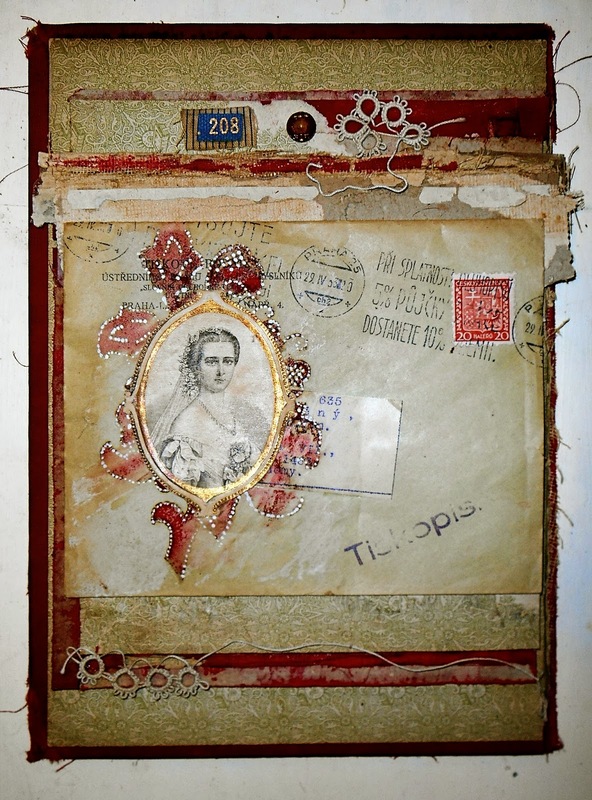 Essentially you use an old wooden spool, and a long sandwich of fabrics and lace to create a surface for a tiny collage. Shown: Small hexagon vintage fabric pieces from my grandmothers sewing box, metal thimble charm, vintage illustration of cross-stitch, Pattern # .15 from a fabric selvage, vintage quilted flower fragment. I make my art backwards. I always START by creating a body of random painted, patterned papers. No ideas in mind. Just immersed in papers, paints, dyes, stencils, spackle...anything at hand. I add layer over layer looking for a complexity that pleases my eye...I have no idea what will emerge. These paper form the basis of my subsequent work. It is only later that I get an idea and begin to create a piece of art, usually suggested by the the paper itself. After 20+ years of doing this I am STILL amazed to find among my other collage material "matches" to the most unusual colors, patterns, and happy paint accidents. Recently (see blog from October 8, 2013) a crazy color-dying afternoon a few weeks ago resulted in a big new batch of papers. 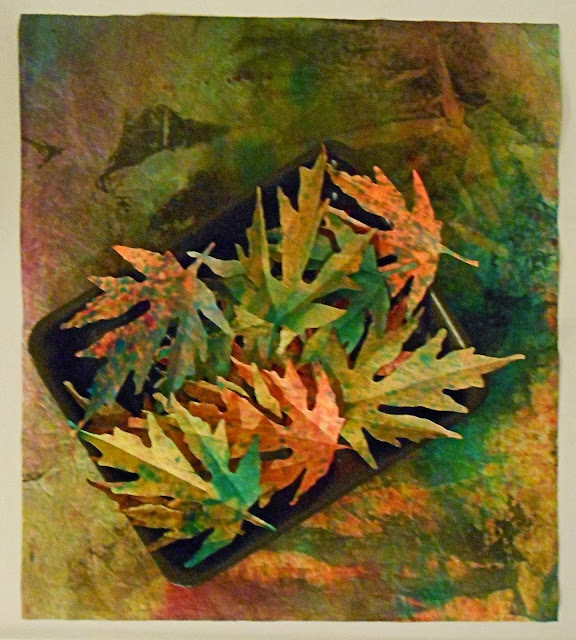 In the case of the leaves below - I noticed that one large sheet had all these colors in the amazing subtle and bright blends of fall leaves, so I cut out leaves. Oh my!! That is when magic happens for me. They LOOK like fall leaves!! 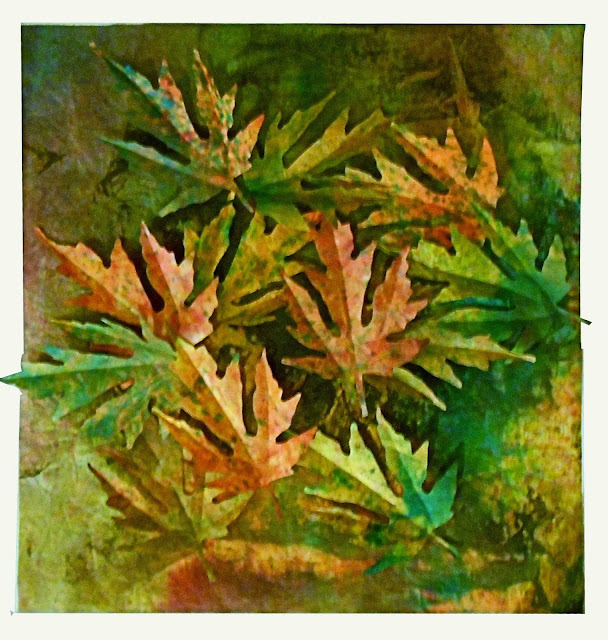 I personally could not have painted these individual leaves so beautifully...(other people can and do, and I admire them)...because, well, lol, I work backwards. 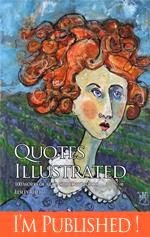 My Artwork Published In This Book!